There is a point were the pain all becomes silly. I’m too tired and goofy right now to tell you about this amazing day. I am going to hand this off to someone else who is more qualified than me. Today was the most trying day so far. I found myself on a roller coaster of emotions. Mostly between the joy of realizing that my body is starting to hurt much less, and the complete dismay of turning around a bend and realizing just how much more there is to go. 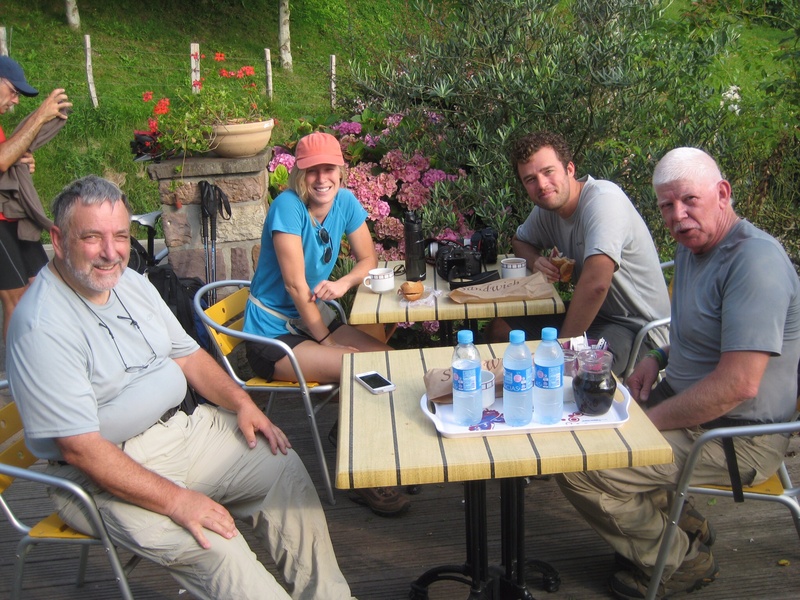 I know that the Camino isn’t supposed to be about the end but rather getting there and how you spend that time, the things you learn, and the people that you meet.. But since I’m a very goal oriented person, I find myself getting mad at my body for not going faster and mad at the road for not being shorter. I’ve really been struggling with that lately, not just on the Camino but in life. I find myself constantly nostalgic or planning out the future but never stopping to enjoy the moment. To stop and stare at the beautiful wide open fields of Northern Spain, to take a deep breath and relax instead of constantly worrying about getting there alright. After all, the worrying is so pointless. Tomorrow I plan on taking it easy since I’ve been pushing my body far past it’s normal limits these past few days and I really need to start appreciating my body, this beautiful vehicle that allows me to walk dozens of miles, rather than wishing it could be faster and better. Here I am, three days into this amazing trip, finishing a lovely dinner with old friends and new friends. So many beautiful sights, thousands of steps where so many have walked before, incredible stories from people all over the world who are joined by this experience…the Camino. Sitting in this chilly night under a sliver of the moon, I look forward to the next 5 days and thankful for what this has brought so far. I came to Europe alone to cross something off of my bucket list and learn more about myself and the world around me by walking 500 miles like that one song by the Proclaimers. It’s only been 4 days walking and I already find myself astounded by the show of human kindness I’ve seen between strangers. I came alone but soon realized that you are never alone on the Camino. As I sit here at this albergue I am content in knowing that I can meet amazing people and life long friends even on the other side of the world. Right now Kelly and I are sitting out in front of the hostel under a porch roof. Actually he just ran off with Todd and Jess to film around town. It is 1800 and the sun is still pretty intense. There is an ever changing scene of pilgrims talking, drying their clothing or drying their hair. The wind is gusty. An occasional car goes by. Somehow, we wound up with two bottles of wine to drink up tonight as no one wants to carry another extra thing tomorrow. Met a most interesting lady from Ireland today, Mairead.y. We were going to met her to check out the ” spectacular” church but we can’t find a ride. We will catch up with her tomorrow or the next day is the way to think about it. Discovered gazpacho today. Every day I tell someone about Sister Joyce. Another day on the Camino. Time to say my rosary. Kelly, Todd, Jessica and me. Taking a short day today since are all in various shades of battered. We off on a side trip to see “spectacular” church in Eunate, just west of Pamplona. All good, Phil. The Camino opened my eyes. So many wonderful people, beautiful nature and places to stay. This is a start of my life lesson. I intend to enjoy life more and be inspirated by the small things in life. Phil and Kelly are amazing guys, full of humor, good spirit, and positive thinking. around me. Glancing over at Phil’s bed i realized he was already halfway packed for the day. I had the choice to either meet him in his urgency or take a look at my phone to see if I had time to catch another 5 minutes of sleep. I choose the later. When I read my phone it said 2:05. Check my camera to confirm. Yep, 2:05. Apparently Phil’s phone was stuck on the time that he had intentionally set his alarm for. One could be upset at the disruption of sleep, but I was just grateful that I had 4 more hours of shut eye. 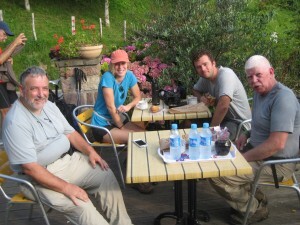 On the camino it’s easy to meet nice people and that’s why I am having dinner with Phil, Kelly and the group! Love, Helen. We walked over every possible type of surface today but ice and snow and maybe wall to wall carpet. Walked through the beautiful city of Pamplona this afternoon. Also, need some help on the “Bear Rabbit” song. What is after mr. Bluebird is on my shoulder? Hi. Jessica here. Phil handed me his iPad and told me to write. Firstly, Phil and Kelly are cheeky, funny, deep, and absolutely easy to film. Everyone around them are drawn to them. And the ladies we are eating dinner with we’re naming all the things they loved about Phil and Kelly before they arrived for dinner. Secondly, I must mention pace. Todd and I are participating as much as we can in walking and are learning just as much as the next pilgrim about pace. Today my pace was jumping off a bridge into water, eating ice cream in the street where the bulls run and walking just a little less than was expected to rest my knee a bit. Pace is everything. Find your pace! We made it to the hostel before the rain came. Walked about twenty kilometers to this town of Zubiri . This morning was very private for us but we fell into a great group for the afternoon. Two Dutch sisters, agal from Sweden and a fellow from Egypt. We talked our heads off and the kilometers went by quickly. This is an amazing fact finding mission and I can’t wait to share it with you as it unfolds. Will try and include some pix next. But the lights are going off here in a few moments. Tomorrow is coming soon, Phil.